WINDHAM – For the fourth and final concert of the 2012 “Music On the Hill” concert series, the Windham Hill UCC, 140 Windham Center Road in Windham, presents the return of the Denny Breau Trio, on Saturday, July 28. The trio consists of singer-songwriter-guitarist Denny Breau; his wife and gifted flutist, Ann Breau; and singer-songwriter, and bass guitarist, Frank Coffin. These multi-talented musicians offer a wide variety of music styles: country, Delta blues, folk, and jazz! Breau first performed at Music On the Hill in 2003, with Turkey Hollow; and this Saturday will enjoy his third performance with his trio at the Windham venue. Denny started playing guitar when he was 9 years old, and was performing professionally by his early teens. His parents, Hal Lone Pine and Betty Cody, were popular country performers in the 1940s. His older brother, the late Lenny Breau, is considered a jazz guitar giant. Over the past 20 years, Breau has garnered numerous awards from the Maine Country Music Association, earning “Entertainer of the Year,” “Album of the Year,” “Male Vocalist of the Year,” and “Instrumentalist of the Year” many times over. Denny was inducted into the Maine Country Music Hall of Fame in 2004, the youngest inductee in the history of the organization. During more than 30 years as a full-time musician, he has performed with many well-known artists, and picked alongside other outstanding guitarists. Breau was a member of the roots music trio, Turkey Hollow, with Tom Rowe and Tom’s son, Dave, starting in 1998. In addition to his many solo and group performances, Breau gives private guitar lessons and teaches music clinics. Ann Breau is an accomplished flutist who has performed throughout central Maine. Her virtuosity on the flute allows her to run the gamut of styles from classical to modern to jazz. Ann has more than 35 years of professional playing and teaching experience. She has recorded for television and radio as well as albums for various artists. 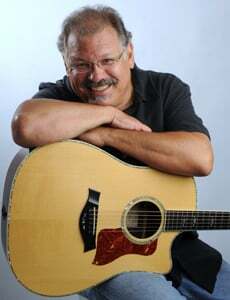 Singer-songwriter and bass guitarist Frank Coffin is well-known throughout Maine. He has toured the East Coast and Europe, and has received more than his share of musical awards. Refreshments will be served following the concert; and Breau will have CDs available for purchase. Concert tickets may be purchased at the door: Adults are $12, seniors and children 12 and under are both $8. Children five and under are free. For reservations, call 892-2154. For more information, call 892-4217, or go to www.windhamhillucc.org. Maine blues guitarist and singer-songwriter Denny Breau and some of his musical friends will be on stage at Windham Hill UCC’s final Music on the Hill concert Saturday night.